Mountain Style: The Bistro’s location in downtown Bryson City offers fine American dining in a boutique hotel. Entrées include the savory, sweet, and smoky crab cake, served with fresh corn, blackberry coulis, and topped with wild Sockeye salmon. Spring Bounty: The Bistro updates its risotto to fit the season. Above, the spring version mixes gently roasted garlic, shallots, portobello mushrooms, and green peas. Start to Finish: Above, blue cheese-stuffed, bacon-wrapped dates served with a honey drizzle are a favorite appetizer at the restaurant. A slice of deep-dish chocolate chip pie with pecans, served warm, is accompanied by a scoop of vanilla ice cream. The Draw: Appetizers and entrées highlight locally raised and wild-caught ingredients like venison and trout. The Drawback: Some dishes could benefit from more seasoning or more creative sides. Laid-back and picturesque, Bryson City entices visitors because of its proximity to the Smokies, historic railroad, and the wealth of opportunities it offers for people who love to get outside. It’s also home to The Bistro at the Everett Hotel. Formerly known as Cork & Bean, the Bistro is a distinctive dinner spot with fresh, inspired entrées that will recharge you after a day spent in the great outdoors. 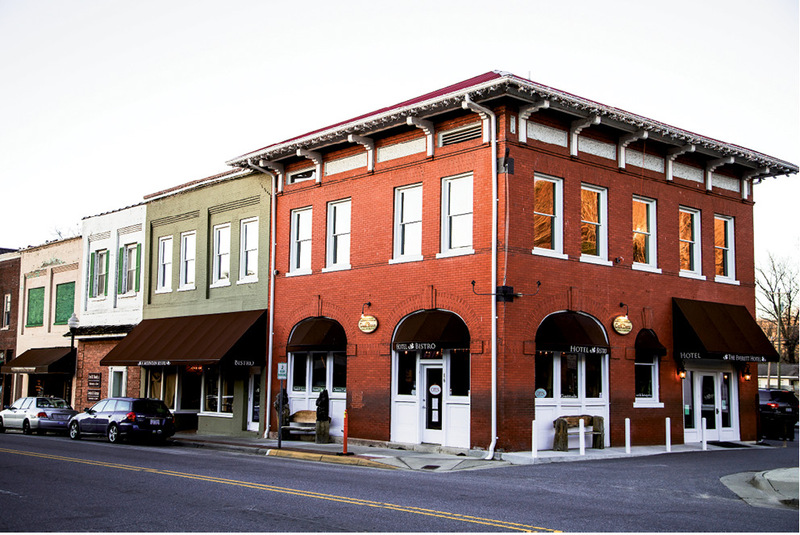 Located on a corner block in downtown and near the Tuckasegee River, the Bistro is housed in the Everett Hotel, a boutique inn known for its elegant rooms and rooftop terrace for guests. Whether or not you stay overnight, the Bistro welcomes all. A polished glass door and large windows that face out onto Everett Street allow passersby a glimpse of the mountain lodge-inspired interior, where handmade furnishings crafted from local materials channel the surrounding landscape. Rustic chandeliers light both the bar and dining areas, and everything glows with the richness of burnished wood. The Bistro’s philosophy, like the restaurant itself, is simple and elegant: “Eat with integrity—Live with gratitude.” This mission has made the eatery Bryson City’s premier fine dining establishment. For hotel and bistro owner Ron LaRocque, integrity is as much about the quality and preparation of food as it is about eating it: “Everything on the menu is fresh,” he notes. “It’s organic and locally sourced as much as possible. We stick to that level of quality in what we do.” Under the creative direction of Chef Neil Ravenna, the restaurant has become known for its flavorful take on American cuisine. Despite its fine dining status, the Bistro invites relaxation. My party of two arrived a few minutes ahead of our reservation and was offered an immediate table in the high-ceilinged dining area. We spent some time perusing the wine list, which offers standards as well as some less commonly seen choices, including several North Carolina wines. We settled on the Pacific Redwood, a fruit-forward organic red blend from California. To begin the meal, we picked two appetizers: the crab dip and the special chili, which featured wild-caught and grass-fed meats, including bison and venison. The dip, made with lump crab meat and cream cheese, was decadent, silky, and served hot. I would have preferred fresh bread or vegetables to the pita crackers provided for dipping, but it was delightful nonetheless. The chili was well-spiced, with a deep, earthy flavor. Served with a slice of cornbread, it was a comforting start to a spring evening that had turned cool and breezy. The trout dish features cornmeal-crusted fish from Carolina Mountain Trout in Andrews, served with a citrus gravy atop a blend of grains and vegetables. The crust sealed in the flavors of the trout, which was complemented by the crisp vegetables and nutty grains. I would have loved more seasoning in the cornmeal crust, but I appreciated that the fish was front and center. The étouffée was satisfying and savory. Bites of Andouille sausage, duck, wild boar, and cranberry sausage were nestled in the rich, long-cooked sauce. The bowl comes topped with basmati rice and a side of warm, red pepper-flecked rosemary cornbread to mop up any leftover goodness. Although the generous entrée portions left us pleasantly full, we were not immune to the siren song of the Bistro’s desserts. We settled on the deep-dish chocolate chip pie with pecans, served à la mode. The pie, warm and drizzled with chocolate sauce, married the best qualities of a pie and a cookie right out of the oven, with a flaky crust and chocolate chips baked into a brown-sugar filling. We were impressed with the freshness and flavor of every dish and left the Bistro happy and full, walking out of the hotel and into the night as the moon rose over the Tuckaseegee River.